The most exasperating problem confronting attempts to cultivate moulds is contamination by other moulds. Most mould spores are very light and easily transported by air. Even opening the lid of a Petri dish for a few seconds may allow the entry of contaminating organisms. The worst contaminants are usually moulds, but bacteria and yeasts can also be a problem, especially when attempting to isolate from natural materials. The slimy or pasty bacterial and yeast colonies grow over the top of young cultures and simply smother them. Many bacteria are motile and "swim" along the mould hyphae, congregating at the end where they can share in the nutrients produced by the enzymatically active hyphal tips. Actinomycetes may also invade cultures from time to time. In older cultures they may even grow on top of the mould colonies. Actinomycetes usually produce large numbers of spores and can be difficult to eliminate. One of the worst causes of contamination is mites. Mites are small relatives of spiders and ticks that often feed on fungi. They crawl from one source of moulds to another and in the process carry spores of moulds and actinomycetes with them. Once they get into a culture collection they are extremely difficult to get rid of; usually one must go back and re-isolate all of one's cultures to purify them. The techniques for doing this may be difficult and extremely slow. Sometimes cultures may be lost altogether. Mites are quite small, sometimes less than 1/10 mm long, and can come in a number of colours. The ones that most commonly get into cultures are white to cream-coloured and move rather slowly. Their eggs, also white, resemble tiny, smooth footballs scattered over the colony surface. All mites have eight legs, are usually covered with scattered bristles, and are often covered with spores. If you find mites in one of your plates or tubes, separate it from the rest immediately and try to isolate the mould into a pure, mite-free culture. Setting the culture in an airtight box containing a dish of mothballs or paradichlorobenzene for several days will often kill the mites and spare the fungi, although the contaminants brought in with the mites will survive as well. If you have a duplicate culture or do not want the old one, sterilize the contaminated plate or tube, mites and all. I cannot emphasize strongly enough the necessity of keeping mites out of a collection. The best way to avoid contamination is by cleanliness. Keep the work area as clean as possible, wiping down all surfaces with a 10% commercial bleach solution before starting to work. The major source of contaminants in pure cultures is airborne dust. While cleanliness is essential, it will not completely stop contamination; the cleanest of laboratories will still have problems. The number of airborne spores can be reduced drastically by eliminating as many air currents as possible. Fans, air-conditioners, and all kinds of traffic stir up dust continuously and should be avoided. At least an hour before beginning to work, shut the windows and doors, turn off fans and air-conditioners, and stay out of the room. Such precautions can be effective, even under difficult field conditions. While transferring plate or tube cultures, open their lids for as short a time as possible. The less time allowed for entry of foreign spores the better. It is also wise to avoid opening Petri dish lids any wider than is needed for the accomplishment of the work in progress. I have seen many students open a Petri dish and put the lid down on the table. This habit is unnecessary and only invites contamination. Spores sometimes stick to necks of tube cultures and can fall into the tube. For this reason it is wise to flame-sterilize the mouths of all tubes and bottles that one opens. When a piece of natural material is put in a Petri dish a mixed culture of two to several organisms will often be obtained. Where one of these is a bacterium the culture can usually be purified by means of antibiotics. Media such as Martin's Rose Bengal Agar are especially designed for this purpose and nearly always inhibit the bacteria. If moulds are a cause of contamination one of the selective isolation techniques discussed earlier will have to be followed or one of the "decontamination" procedures that follow. In the initial isolation of fungi, the most important thing is to watch cultures closely as they first develop. Frequently the mould that is wanted will be accessible at first and easily transferred, but will be entirely overgrown by undesirable moulds later. In isolation from fresh material the first 12-72 hours are especially critical; cultures should not go unexamined for more than 15 hours at a time during this period. The ability to purify mixed cultures is a skill that must be developed by everyone working with moulds. It is also one of the most difficult things to learn, as it requires a good knowledge of both the fungus one wants and those contaminating it. Although I will not be able to cover this subject in the detail required to purify all cultures, I can at least lay down some general guidelines. Purifying cultures can be done in one of two ways: (1) mechanically or (2) chemically. In the first the organism one wants is physically separated from the rest while the second depends on the physiology of the organism. Often it may be useful to use both techniques simultaneously. The simplest means of separating moulds is to spread their apart far enough that the colonies resulting from their germination will not grow together for a time. A common method is to place a spore mixture on the agar on one side of a Petri dish and streak it up and down that side until the spores are evenly spread along a line. The streaking is done with an inoculating wire having its tip bent into a loop so that it will not cut the surface of the medium. Sterilize the loop and do a second streak at right angles to the first along another side of the dish. This results in a second line bearing far fewer spores than the first. Repeat this a third time to yield another line. If it seems necessary, do it a fourth time, but be careful not to streak into the first line. After two or more days one of the streaks will be seen to contain several separate colonies that can be used for transferring. The previous streak will be too crowded and the subsequent one too sparse. This simple technique is the one I use most commonly for purification of mixed cultures (Figure 12). Figure 12. Streaking technique to separate mould or bacterial colonies. An inoculum of spores is placed on the agar surface at point I and is streaked along the line a-a1 with a sterile wire loop. A second streak b-b1 is made at approximately right angles to the first streak and is followed by a third right-angle streak at c-c1. A fourth streak d-d1 is made into the centre. Each successive streak contains fewer spores and resulting colonies than the one preceding it, finally yielding at d-d1 several widely separated colonies. A similar result can be obtained by using dilutions as described in the section dealing with isolation techniques. It will prove more useful than the streaking technique when the mould that is wanted is greatly outnumbered. Just take a mixture of spores and stir it up in about 10 ml of sterile water. Dilute this down several times and plate out each dilution separately. The ideal dilution will produce a plate containing about 60 colonies, of which at least some will be the desired mould. When a mould is contaminated with yeasts or bacteria, dilution techniques usually work well. At times, though, yeast or bacterial cells so outnumber the spores of the desired fungus that dilutions are useless. Then it may be helpful to take advantage of the tunnelling or bridging abilities of fungus filaments. A technique sometimes used is to embed glass rings in the medium and surround the contaminated colony. A sterile glass ring, about 10 mm high and 15 mm in diameter, with three "feet" 2-3 mm in diameter glued or welded to the rim on the bottom, is placed on the bottom of a Petri dish. Sterile medium is then poured in to the usual depth, being careful not to overtop or wet the glass ring. After the medium has solidified, the mixed colony is inoculated into the glass ring. The mould filaments will be able to tunnel down under the ring and back up to the surface, while the bacteria or yeast, lacking the forward pressure of hyphae, will be confined to the ring. 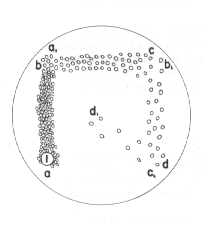 The apical growth of mould hyphae can be used to bridge gaps in the medium insurmountable to bacteria and yeasts. A good method to follow is to make a small moist chamber by putting a few layers of wet filter-paper in a Petri plate. Then flame-sterilize a microscope slide, put a square of agar medium near the edge of it, inoculate the agar with the mixed culture, and put the whole thing in the moist chamber. After a few days the hyphae of the desired mould may extend out into the air from the agar block. If they do, place another agar block on a second sterile slide and move it close enough to the first block to contact the aerial hyphae but not the block itself. If one is successful, the hyphae will grow into the new block, leaving the yeast or bacteria behind. In some cases, mechanical purification techniques just don't seem to work. If they don't one can take advantage of the chemical or nutritional differences between micro-organisms. The most basic technique is to use antibiotics to discourage bacteria. Most bacteria are sensitive to antibiotics, although no antibiotic will work for all of them. In routine isolation work we use a mixture of antibiotics, most often streptomycin and chlortetracycline at a concentration of 30 and 2 mg/l respectively. Few bacteria are able to grow in such a medium, while most fungi are unaffected. In fact, fungi are so tolerant of these substances that we sometimes just sprinkle a little of the powdered antibiotic right on the agar surface in a Petri plate. In the formula for Martin's Rose Bengal medium, given in the previous chapter, the rose bengal dye is added because it acts as an inhibitor to the growth of bacteria and many moulds. It can be added to any medium and is often useful in helping to separate otherwise rapidly spreading colonies. Oxgall, used in the formulation of DPYA, serves a similar function. Most moulds have at least some nutritional preferences that distinguish them from other moulds. These preferences can be used in the purification of cultures if the physiology of the organisms involved is known. Zygomycetes, for example, grow rapidly on glucose or maltose media such as Leonian's and will overgrow everything, but cannot grow on some complex compounds like cellulose. Thus a medium such as Czapek's, with cellulose substituted for sucrose, will put zygomycetes at a distinct disadvantage. The use of selective media for purification of cultures is so dependent on experience with moulds that it is difficult to generalize. A beginner should experiment with several media to see what will happen. The section on selective nutrients in chapter 5 offers suggestions about specific substances.